It has been one year since you all elected us to serve you and therefore, it is a good time to look back and see whether we met your expectations. We submitted a detailed report of the past year to the General Body meeting held couple weeks ago. We were able to organize 14 programs for members, that is, at least one program per month thanks to your outpouring support. The rising popularity of KCS is evidenced by the annexation of two new subsidiary units( Senior Citizen Forum and Friday Group of Goldies) into KCS in this year. The biggest achievement is that KCS brought the KCCNA Convention back here to heal the wounds on our pride inflicted by the events in 2012. 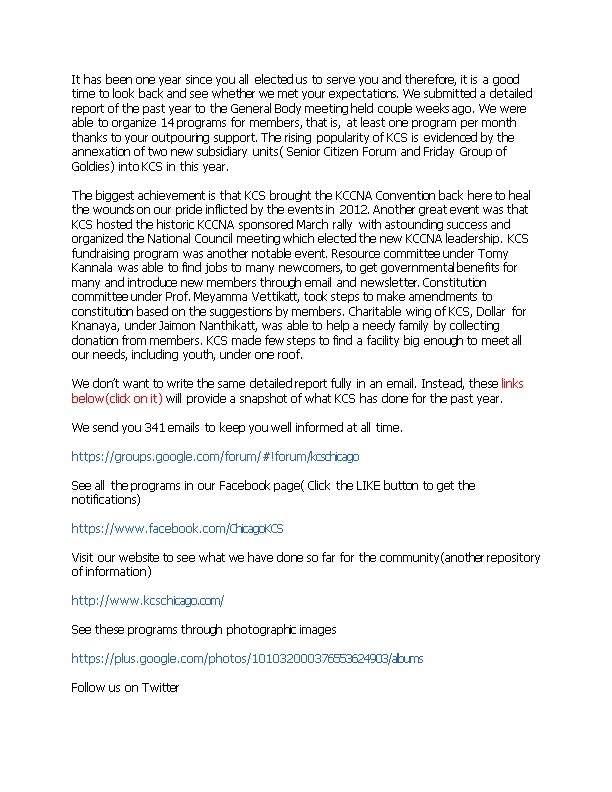 Another great event was that KCS hosted the historic KCCNA sponsored March rally with astounding success and organized the National Council meeting which elected the new KCCNA leadership. KCS fundraising program was another notable event. Resource committee under TomyKannala was able to find jobs to many newcomers, to get governmental benefits for many and introduce new members through email and newsletter. Constitution committee under Prof. MeyammaVettikatt, took steps to make amendments to constitution based on the suggestions by members. Charitable wing of KCS, Dollar for Knanaya, under JaimonNanthikatt, was able to help a needy family by collecting donation from members. KCS made few steps to find a facility big enough to meet all our needs, including youth, under one roof. We don’t want to write the same detailed report fully in an email. Instead, these links below(click on it) will provide a snapshot of what KCS has done for the past year. We send you 341 emails to keep you well informed at all time. See some of the programs in our own YouTube channel! KCS recognizes that advances in technology have had significant impact on almost every group of people throughout the world, including the many people served by KCS and that society is moving toward a greater reliance on digital communication. We would like thank SanishArackaparambil for helping us to modernize our email communication and enter into the world of social media. We thank Teddy Muzhayanmakkal for maintaining our website and adding more features to it. We expresses our gratitude to SajiPanayaparambil and TibuMyladumparayil for providing free video coverage for few programs and Dominick Chollempel for covering the historic March rally for free.